Includes 4-hours sailing on Bellingham Bay, amazing view of fireworks show and full dinner. Drinks are available for additional charge. 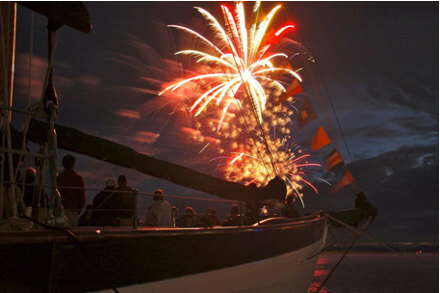 Have the best view of the Fireworks show on Bellingham Bay from the Zodiac’s 127ft of deck space. 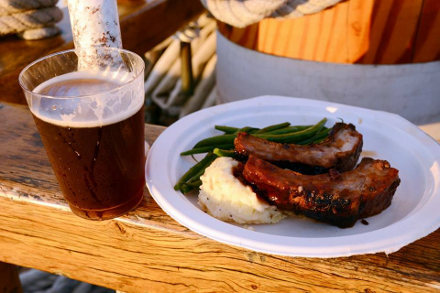 Set sail from the Bellingham Cruise Terminal in the historic Fairhaven district for an evening of delicious home-style food, powerful sailing, patriotic cannon fire and an exquisite view of the fireworks. Help raise the largest mainsail on the west coast of the United State and then settle on deck to enjoy the beautiful scenery around Bellingham Bay. The sail features views of Lummi, Portage and Eliza Islands as well as the stunning views of the Chuckanut Bay coastline. As the American flag flies from the stern of the ship, we will fire off a salute from the ship’s cannon to recognize our nation’s birthday. The ringing of the galley bell will signal the serving of a hearty roast pork rib dinner along with a variety of seasonal salads and sides. Local beer, wine and craft cocktails as well as soft drinks are available from the ship’s bar. Dinner and libations can be enjoyed on deck as the sun sets over Bellingham Bay and the ship nestles near Squalicum Harbor in preparation for the fireworks show. After enjoying the show the Zodiac will return to its berth at the Bellingham Cruise Terminal.